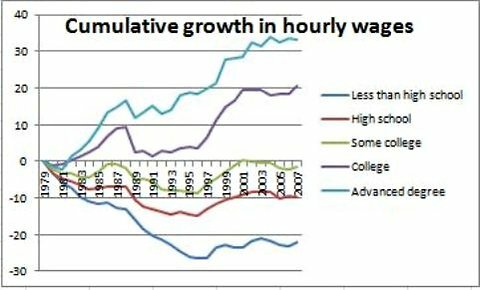 Does Higher Minimum Wage Reduce Jobs? Arindrajit Dube: Research shows raising minimum wage does not impact job loss in short or long term. – Interview about the county-pair and city-pair studies following Card-Kreuger. Who Really Gets the Minimum Wage? Minimum wage vs. housing costs in major cities: http://www.huffingtonpost.com/gino-zahnd/one-bedroom-rents_b_7623948.html? Additional benefits of raising minimum wage: eliminates projected Social Security shortfall vs. promised benefits in 2033. People want to understand phenomena. We want explanations for what happens. Journalists, especially TV and radio journalists, want explanations that can be summarized in 1-2 sentences in a sound bite. Randomness is pretty scary. And anything that’s too complex to understand easily looks a lot like randomness. So what triggered this little nugget of metaphysical social observation in an economics blog? Reporting on the stock market! Everyday we (those of us who read, listen or watch the news) are treated to not only reports of what the major stock market averages have done that day, but we’re always given a simple and easy explanation. Just look at today in the NYTimes. I’m not trying to pick on The Times, it was just the first thing showing on Google Finance as I wrote this – any source, any time and you’ll get similar simplistic explanations. Krugman posted this evening that he didn’t understand it. But he approached it from the standpoint of “does this action by ECB make economic sense that should improve stock prices?’. I think he’s right that it doesn’t make sense, but I think he misses a bigger point. It’s foolish to try to attribute the movements of stock market averages on any given day to the any particular sentiment of investors or any particular logic of rational investors. The markets are huge. We’re talking hundreds of billions and trillions of dollars in trades. Daily volume is in the billions of trades everyday. It’s complex, folks. The reasons these trades happen and why they happened at the prices they did are really, really complex. It’s kind of like ancient peoples trying to understand the stars and without even a telescope or any calculus! Unfortunately, like them, we want simple explanations. So we invent them. And like ancient peoples we make sure our explanations support and reinforce whatever religious or superstitious beliefs we have. [readers are advised not to try to decide what my spiritual beliefs are based on that sentence – it’s complicated]. There is a belief that supports much of this daily “this is what the market did and why” reporting. It’s actually based on the theory that markets are rational and “efficient”. There’s an economic theory that holds that prices in financial markets accurately reflect the current state of all known information and news regarding the future flow of earnings and profits from firms. It’s demonstrably false, but it has quite a following among neoclassical economists. It cannot be proven and evidence exists to contradict the hypothesis (see Quiggin’s Zombie Economics), yet it’s taken as article of faith among many, many economists. So much so that some non-believing economists have begun to refer to neoclassical economics as theo-classical. The whole idea that there’s a single sentiment or key piece of news that drives the stock market each day is made even more absurd when we realize that most trading isn’t even being done by humans! The significant majority of all trades are done by computers based on algorithms such as “buy this if the price has moved x in the last y seconds”. Even more of the trading is done by casino-oriented short-term trading by large banks and hedge funds who are only trying to figure out what they think the other traders are going to do a few seconds before they do it. (also known as Keynes’ beauty contest). Is The Fed Corrupt or Captured? …it is unseemly for The Fed to be able to make large loans on favorable terms to banks, loans that save those banks’ managers from failure, without any sunshine or transparency. It makes fertile ground for corruption. Today I want to look at the question of whether The Fed, as it is currently constituted, is corrupt. The Fed has generated a lot of populist anger. A quick Google search for “end the fed” turns up over 8 and 1/2 million results. A lot of people seem to feel there’s something wrong here with The Fed, even if they can’t pinpoint what it is. Typically the charge has been that The Fed has been guilty of creating (“printing”) money too fast and producing inflation. We’ve seen that’s not true. Inflation is not our problem and hasn’t been for 20-30 years. Nevertheless, many people feel there must be something wrong. Going by this definition, The Fed is corrupt. It’s characterized by improper conduct and it’s debased from a correct condition (although the original condition wasn’t much better). Let’s take a closer look to understand problems better. The Federal Reserve Bank of New York is the most influential of the Federal Reserve Banking System. Part of the New York Fed’s responsibilities is the regulation of Wall Street, but its president is selected by and reports to a board dominated by the chief executives of some of the banks it oversees. While the New York Fed has always had a closer relationship with Wall Street, during the years that Timothy Geithner was president, he became unusually close with the scions of Wall Street banks, a time when banks and hedge funds were pursuing investment strategies that caused the 2008 financial crisis, which the Fed failed to stop. In the wake of the financial meltdown, Geithner became the “bailout king” of a recovery plan that benefited Wall Street banks at the expense of U.S. taxpayers. Geithner engineered the New York Fed’s purchase of $30 billion of credit default swaps from American International Group (AIG), which it had sold to Goldman Sachs, Merrill Lynch, Deutsche Bank and Société Générale. By purchasing these contracts, the banks received a “back-door bailout” of 100 cents on the dollar for the contracts. Had the New York Fed allowed AIG to fail, the contracts would have been worth much less, resulting in much lower costs for any taxpayer-funded bailout. Geithner defended his use of unprecedented amounts of taxpayer funds to save the banks from their own mistakes, saying the financial system would have been threatened. At the January 2010 congressional hearing into the AIG bailout, the New York Fed initially refused to identify the counterparties that benefited from AIG’s bailout, claiming the information would harm AIG. When it became apparent this information would become public, a legal staffer at the New York Fed e-mailed colleagues to warn them, lamenting the difficulty of continuing to keep Congress in the dark. Jim Rickards calls the bailout a crime and says “the regulatory system has become captive to the banks and the non-banks”. Instead, we have ideological and social capture of the top regulators. This is an issue that trumps what can be a model regulator at the bottom where the line people are quite competent, able and uncaptured, but the message from the top skews their effectiveness…. For an example of social capture at the top, one need only look at the publicly available calendars of Treasury Secretary Timothy F. Geithner and his predecessor, Henry M. Paulson Jr. The people regulating the financial industry largely come from that industry or look to that industry for their social interactions. They play squash with them and dine with them, and these are the peers they look to when they have issues to discuss. Jo Becker and Gretchen Morgenson of The New York Times documented this ably in their April 2009article on Mr. Geithner’s social interactions during his time as head of the Federal Reserve Bank of New York. Lawrence H. Summers may not be as social, but even he worked at a hedge fund in the year leading up to his current position in the White House. Among these people, there is no evil or nefarious plot to regulate in favor of the banks. These men and women may believe they are doing their best, but their worldview is affected by the people they interact with. This is a problem that can be exacerbated by a revolving door between finance and regulators. James Kwak and Simon Johnson, the authors of the book 13 Bankers, have written extensively about the regulatory capture of The Fed and the resulting improper conduct and debased condition of the world’s largest central bank. The book is worth checking out, as is their blog The Baseline Scenario. Bill Moyers interviewed them for PBS on these topics. You can watch the video or read the transcript here. It was evident before that. I March 2010 I recounted how Nobel-prize winner Joseph Stiglitz accused The Fed of being corrupt and said if a developing nation had a central bank like The Fed, we’d pressure them to change. So, yes, The Fed is corrupt because it has been captured.